The kids are back in school and the weather is getting cooler, which has us looking forward to fall, but not wanting to be there completely until we’ve had our sunflower fill. Sunflowers, of course, can be enjoyed year round, and their warm color certainly makes them perfect to give as an autumn gift. But, we do associate sunflowers with summer and we suspect many others do too. So, for a last hoorah for the sunflower this year, let’s talk about some absolutely spectacular colors and varietals that you may not know about. The “Shock-O-Lat” sunflower has a large flower head with many branches, and it features deep blooms that are a dark brown color, just like a chocolate bar (hence it’s name). Stunning yellow tips adorn the luscious petals and a gold halo encircles the center disk. This sunflower grows to be about 6 feet high. 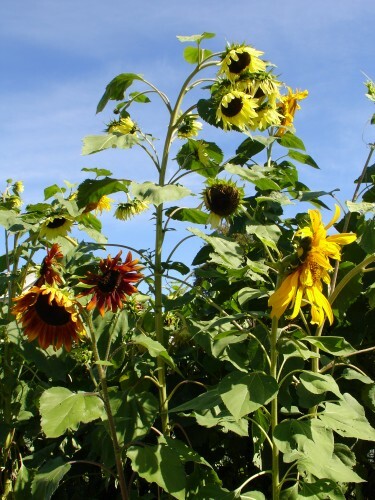 A beautiful offering of gold, brown, mahogany and orange, the “Earthwalker” sunflower is rustic and magical. It comes in solid and bi-color varietals, with the blended blossoms being absolutely something to admire. When we talk about flowers that make a statement, these beauties must be on a list of blooms to consider. They grow on 6 to 9-foot plants and have multiple side branches clustered together. Tantalizing wine-red sunflowers flecked with bits of gold. Perfection. This is the “Chianti” sunflower and it’s a stunner growing on a dramatic purple stem. Looking like nothing we’ve seen before, set atop a 4 to 5-foot plant, these sunflowers sit in bunches on branches tightly clumped together. Place these gorgeous blossoms in a vase or bouquet to make heads turn. Until next week, enjoy looking for these sunflowers to give and looking forward to what blossom we’ll celebrate next week.